WILBERFORCE — Central State University recently announced Dr. B. Sherrance Russell as its new vice president for student affairs and enrollment management. Russell will be responsible for expanding and improving the student profile of the university. This includes continuing to improve the processes of enrollment management, student recruiting, selectivity, class quality, and admitting students who are most likely to thrive at CSU. He will also develop an enrollment marketing plan and a new retention plan. “I am excited to have Dr. Russell join the Central State University team. I am confident that he will work to develop and implement strategic enrollment and retention practices,” said Dr. Cynthia Jackson-Hammond, president of Central State University. Russell is a seasoned higher education professional and has more than 25 years of experience in higher education. He previously served as senior residence life officer at Prairie View A&M University, a position he has held since 2014. From 2010 to 2014, Russell was the dean of enrollment management and vice president of enrollment management at Huston-Tillotson University where he launched the new adult degree program for working adults. While at Langston University from 1996 to 2006, he served in several capacities including associate director of enrollment management. Throughout the course of his career, Russell has managed more than 10,000 beds in student housing at various colleges and universities. 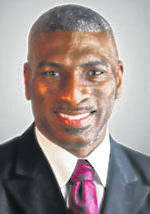 Raised in Austin, Texas, Russell received a bachelor of business administration degree in general business, with a focus on management at Texas Southern University in 1993. He received a master of education degree, with a focus on urban education from Langston University in 1999. He is a 2006 graduate of the Urban Higher Education Executive Ph.D. Program at Jackson State University where he was a member of the inaugural cohort. In addition, he received his license in ministry in January 1999 and was ordained by the Christian Methodist Episcopal Church. Russell will assumed his new role July 1.